BÉDARD, JEAN-BAPTISTE, carpenter and surveyor; b. 18 May 1761 in Charlesbourg (Que. ), son of Thomas Bédard and Marie-Angélique Fiset; m. first 17 April 1792 Marie-Anne Toupin at Quebec, Lower Canada; m. secondly 13 June 1815 Madeleine Daigle in Saint-Ambroise (Loretteville), Lower Canada; d. 7 Jan. 1818 at Quebec. Jean-Baptiste Bédard’s career as a carpenter began in 1782, when he was hired by the Séminaire de Québec through the influence of his brother Thomas-Laurent*, who was its superior. He was sent that year as a “contractor” to Bellevue, the summer residence for its students at Saint-Joachim; later, and until 1787, he was given responsibility for various pieces of construction and maintenance work on the seminary’s buildings in Quebec. Even after being appointed a surveyor in 1790 he continued to make his services available to its ecclesiastics. He carried out survey work for them in the seigneury of Beaupré, the sub-fief of La Trinité, and at Baie-Saint-Paul. In 1796 he also received payment for building the framework for the seminary’s chapel. Bédard was admitted to the surveying profession apparently without any previous training. A study of his reports shows that most of his activity took place between 1790 and 1795. 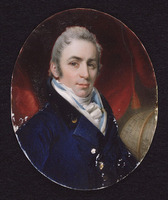 He lived at Quebec and worked mainly in the neighbouring seigneuries, such as Rigaud-Vaudreuil in the Beauce, where in the autumn of 1791 he drew up no fewer than 116 reports for its owner, Gaspard-Joseph Chaussegros* de Léry the younger. From 1796, surveying began to take second place in Bédard’s career, since he gradually returned to his initial interests, those of the master carpenter. The list of important building projects in which he was involved is long. At an early stage he acquired a certain reputation, following the difficulties encountered by Martin Cannon; the stone bridge that Cannon had put up over the Rivière Jacques-Cartier collapsed in the spring of 1802. Bédard appeared before commissioners Gabriel-Elzéar Taschereau, Jonathan Sewell*, and John Craigie with a new model to replace it, a bridge equipped with a complex system of trusses and arches. In the summer of 1804 the bridge was finally rebuilt by Bédard for £50 to the great satisfaction of the commissioners, who had been somewhat afraid that their good name would be sullied by the collapse of the first structure. Probably encouraged by this success, in 1806 Bédard asked for the exclusive right to put up wooden bridges based on two models that he had devised. By an act of 16 April 1807 the House of Assembly did, in fact, grant him that privilege for a period of 14 years, but it is impossible to determine how many bridges were built according to Bédard’s plans. In any event, he was approached in 1810 about building one over the Montmorency, but the cost of the work was considered too high by the overseer of highways for the Quebec region, Jean-Baptiste-Philippe d’Estimauville*. Bédard is also thought to have prepared the plans for a bridge over the Saint-Maurice in 1816. In 1807 Bédard had been associated with the construction of the famous market in the Upper Town that Major William Robe designed. This circular market, considered a daring architectural design, was not built according to the initial plans and was not at all appreciated by the townspeople, to the point that in 1815 Joseph Bouchette* wrote that it must not “continue to be public proof of bad taste.” Bédard, who had constructed the roof of the market, must have been aware of the bill passed by the assembly in 1815 which ordered the building demolished to prevent the risk of fire. When construction of the Quebec prison (from 1862 the home of Morrin College) was undertaken in 1808 under François Baillairgé*’s direction, all the carpentry work was entrusted to Bédard. Similarly, in 1817 he was given a contract for £2,390 to extend Quebec’s Rue Saint-Paul. Bédard’s knowledge was also put to use in the construction of religious buildings. For example, between 1799 and 1804 he put up the framework, roof, and bell-tower of the Anglican church in Quebec, which later became the Cathedral of the Holy Trinity. The bell-tower in particular was called a skilful piece of work by the architect in charge, Major Robe, with whom Bédard worked on occasion. In 1809 Bédard erected the framework of St Andrew’s, the Presbyterian church in Quebec, and then in 1813 he built the roof, vault, and steeple of the church at nearby Saint-Augustin. The parish syndics there had undertaken to supply him with nine men liable for the corvée to help him in his work. To get all these large-scale projects started, Bédard resorted to obtaining loans, generally for less than £100, from important persons or members of his family. These liquid assets served particularly for buying the lumber, which came mainly from a merchant in Sainte-Anne-de-la-Pérade (La Pérade). A master carpenter’s work is difficult to evaluate, the architectural qualities of a building usually being attributed to the person who conceives the project, and not to the one who carries it out. Also, recent studies in architectural history show no awareness of Bédard’s contribution to important works such as the Quebec prison, Holy Trinity, or St Andrew’s. It is certainly not presumptuous to affirm that he was one of the few local craftsmen who succeeded in adapting quickly to the new styles in architecture that the British were trying to introduce to Lower Canada. His ingenuity in bridge-building was, moreover, recognized by his contemporaries. When he died in 1818, Jean-Baptiste Bédard was living on Rue Saint-Joachim at Quebec, in a luxurious two-storey stone house that he had had built eight years earlier by Pierre-Florent Baillairgé, at a cost of £347. He also owned some pieces of property in the faubourg Saint-Roch. Jean-Baptiste Bédard’s surveyor’s reports for 1790 to 1817 are at ANQ-Q, CA1–3. ANQ-Q, CE1-1, 17 avril 1792, 7 janv. 1818; CE1-7, 18 mai 1761; CE1-28, 13 janv. 1815; CN1-16, 7 avril 1809; CN1-26, 1er juin 1808; CN1-230, 3 mai 1804; 6 mai, l9 juin 1809; 3 avril, 6 juill. 1813; 4 juin, 12 déc. 1814; 17 avril, 8 juill., 5 déc. 1817. ASQ, C 37: 5, 8, 20, 22, 45, 53, 93, 104, 152–53, 155, 169; S, S-168; S-169. PAC, RG 1, E15, A, 288–89; E17; RG 4, A1: 27670–71; B33, 18. Bas-Canada, Statuts, 1807, c.15; 1815, c.7. Quebec Gazette, 24 June 1790; 10 April 1806; 26 Feb., 26 March, 2, 9, 16 April, 7, 21 May 1807; 10 Jan. 1818. Omer Bédard, Généalogie des familles Bédard du district de Québec (Québec, 1946), 42–43, 52–53, 98–99. Bouchette, Description topographique du Bas-Canada, 468–69. Luc Noppen et al., Québec: trois siècles d’architecture ([Montréal], 1979),54–5, 320. A. J. H. Richardson, “Guide to the architecturally and historically most significant buildings in the old city of Quebec with a biographical dictionary of architects and builders and illustrations,” Assoc. for Preservation Technology, Bull. (Ottawa), 2 (1970), nos. 3–4. F. C. Würtele, “The English cathedral of Quebec,” Literary and Hist. Soc. of Quebec, Trans. (Quebec), new ser., 20 (1891): 80. Gilles Langelier, “BÉDARD, JEAN-BAPTISTE,” in Dictionary of Canadian Biography, vol. 5, University of Toronto/Université Laval, 2003–, accessed April 21, 2019, http://www.biographi.ca/en/bio/bedard_jean_baptiste_5E.html.